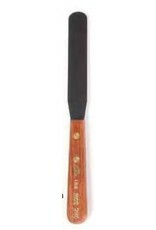 Stainless Steel SpatulasA selection of the finest Italian Steel Spatulas. Painters of Frescos and large landscapes are always looking for high quality knives. These are the best. Print makers mixing ink or painters will find this an excellent selection. All knives have beautiful hand shaped and polished wood handles. Made by artists for artists. Blade length: 4-3/8"